There are 7 reviews of Eau Ressourçante / Eau Tranquility. Soft, gentle, inoffensive no matter how much you spray on- and so very suitable for hot days and shared work spaces. It's gone in an hour, but it's inexpensive and in a large bottle, so you can top up the scent whenever you need to freshen up. Clarin's 'therapy' fragrances are so much better than their perfume lines, although have a very short lifespan as they contain natural ingredients. They are also much cheaper, I have picked up full bottles of Eau Dynamisante for $20, so I have no qualms about spraying them liberally. Another thing is that they are supposed to actually be soothing to the skin, and since I have extremely reactive skin this bodes well for me. It also means that I can dab it on my temples. 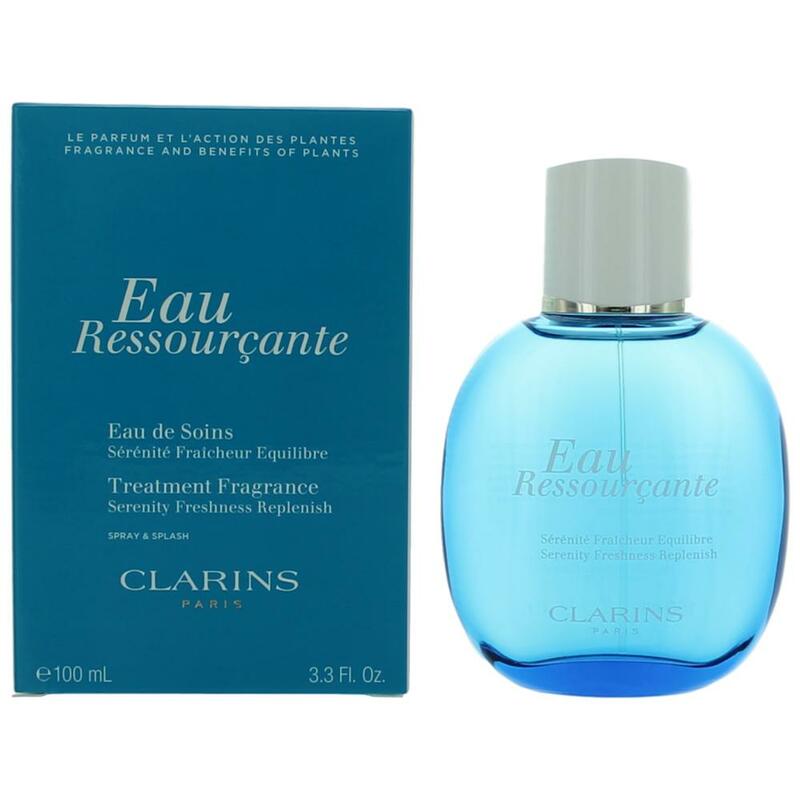 At first I didn't like Eau Ressourcante, I didn't dislike it but it had a plasticy kind of top note. I suspect that this may have been the age of the sample bottles I got, as well as the fact that the plastic cap did not fit well meaning that the perfume may have turned. After that dissipated this truly is a relaxing smell (for the time it lasts) . It's fresh and as with Dynamisante has a very clean smell to it. I like to use this before bedtime after a shower or bath, it helps me drift off to sleep (sometimes I use badger sleep balm or Shisedo relaxing fragrance instead just so I don't habituate to one or the other). I think this would be extra nice layered with the same-scented Clarin's body products. 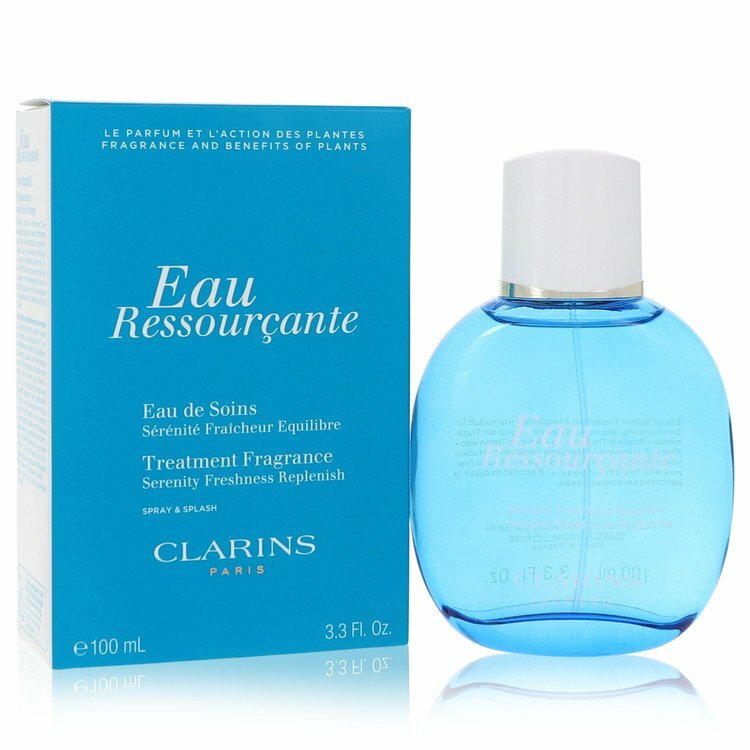 Clarins makes great body stuff, and this to me feels more like a skincare product that a proper perfume, but I like it for what it is none-the-less. Not as great as Eau Dynamisante, but similarly refreshing with more floral notes and a hint of citrus and more energizing than calming. I definitely find this frag more perfumy and less "masculine" than Eau Dynamisante, and it doesn't last as long as I would like it to. In any event, as someone else wrote here, this is a good value. This one reminds me slightly of YSL's Rive Gauche. Totally inoffensive smell, fantastic price for what you get, therapeutic properties and a lovely simple big blue glass bottle! On its own this doesn't do too much for me but I find that if I spray a little D&G Light Blue on first, and then this, that Eau Ress really comes out of itself and is enhanced by the combination. be too much e.g. when you are feeling worse for wear or have a headache threatening. I get a fresh opening and a lovely musky drydown. This is my "go to" scent for relaxing weekend days and relaxing summer holidays. The bottle looks fab on the bathroom shelf too. Gentle, serene and rosy; I love to wear this fragrance when travelling as it calms me down. It's lovely in summer as well - it has enough complexity to count as a 'real' perfume, but feels simple. I get roses and perhaps other flowers, not too sweet, with a background murmur of woods to support and give some longevity. Definitely feminine. A really beautiful fragrance that makes a good gift. There are no member images of Eau Ressourçante / Eau Tranquility yet. Why not be the first?